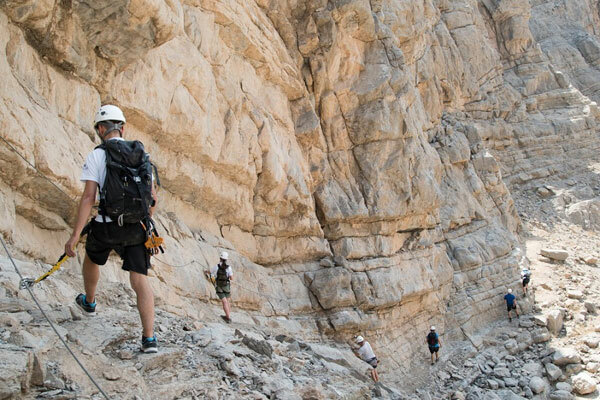 Ras Al Khaimah Tourism Development Authority has announced that the emirate’s unique adventure attraction, Jebel Jais Via Ferrata (Iron Path), will reopen on November 15, welcoming visitors to experience world-class rock climbing and trekking almost 120 meters above ground. Operated by ToroVerde, the Jebel Jais Via Ferrata, is the first of its kind in the region, comprising three individual start and finish points for the guided trekking and hiking experience, as well as three zip-lines measuring 50 meters, 60 meters and 300 meters to expand possibilities for various age and fitness capabilities. Visitors will be able to enjoy the standard route, the Ledge Walk in twice-daily supervised tours starting at 9am – 12pm and 1pm – 5pm, Wednesday to Sunday, offering adventure seekers picturesque views and an exhilarating mountain experience on Jebel Jais, the UAE’s highest mountain. An average tour lasts three hours, and appeals to all fitness levels. Haitham Mattar, CEO of Ras Al Khaimah Tourism Development Authority said: “We are pleased to announce the reopening of the Jebel Jais Via Ferrata adventure attraction, just in time for the cooler weather and winter season. Due to the huge success of this product, we anticipate a greater number of local and international visitors looking for world-class adventures”.